Over the past 14 years, we have tried to either charge no shipping on lighter products or a small fee, if the weight of a product triggered a larger shipping cost. As the cost charged to us to get our products from our vendors has increased steadily over the years, we have tried to incorporate and absorb these costs in our retail prices. Retail prices also absorbed some of the shipping cost to our customers. For example, in January of 2016, most types of USPS shipping increased an average of 25%. So far in 2017, postal rates have been raised on Priority Mal and some other shipping methods. Additionally, the price we pay for our products has steadily increased. All combined, over the years, this has been significantly detrimental to margins. Rather than increase the prices to reflect these costs, we are choosing to charge a nominal shipping fee. A logical, simple and fair way to do this was to simply add a percentage to the total order rather than try to go with weight or other methods that complicate things. So, we will be implementing this method to calculate a shipping fee for all orders. The percentage will be in the range of 3% to 12% depending on domestic or overseas shipping. As we go forward, some fine tuning may be necessary. It is not, nor has it ever been, to make money on shipping, but to break even at best. Most orders for products, unless they are out of stock, special made-to-order, and are in stock, we strive to ship within one or two business days. Note: If you select Priority Mail as your shipping method, delivery is normally two days, but can be up to three days, depending on where your location. Some rural areas away from major cities and mail distribution centers do take three days in-transit time. Also note that the two or three day transit time is from the day of shipping, NOT the day you place your order. We use the US Postal Service for shipping all orders, unless you make other arrangements in advance of ordering or if after ordering you notify us requesting Express Mail, UPS or FedEx, which constitutes an additional fee. Orders less than $100.00 will be sent regular mail (unless arrangements as noted above are made). Orders over US$100.00 and products weighing over one pound shipped within the United States are shipped by USPS Priority Mail. For an additional fee you can have your order sent within the USA by USPS Overnight Delivery. For Overnight or any other type of delivery (UPS or FedEx), please contact us by email or phone to make the necessary shipping arrangements BEFORE you order. We will work with you to be sure special delivery requests are followed to your satisfaction and for the most affordable cost. The PayPal system for processing your order does not currently allow for these special additional services. Overseas Customers Please NOTE: We have noticed that over the past few months, there has been an increase in shipments being returned for various reasons. The highest percentage are for "address unknown" and "addressee not at this residence". Please make sure the name and shipping address you enter in the "Ship To" section of the order is in English and is accurate. If we receive packages returned, we will notify the customer and will have to charge a re-shipping fee to get the package to the correct address. Thank you for taking the time and effort to get this information right the first time. It will save all of us money and frustration. All charges to your debit/credit card or PayPal account will be shown as purchased from G&JSales. This is done for your privacy. Additionally, for your privacy, we are discrete in our package labeling. The "from" company name on your package will show as being sent from: G & J Sales and Marketing. Overseas shipping for certain items that contain extra mailing weight, such as our TENS kits, Spectra360 Gel and our brass vacuum pumps, can carry an additional specified charge. We have indicated this as a non-USA fee in drop-down boxes for these products.  This fee is added to the product at the PayPal shopping cart. As mentioned above, any special mailing services you may wish to add can be arranged by contacting us via email BEFORE you place your order. NOTE: TAXES & DUTY are not paid by G&J Sales and Marketing. Taxes and any other duties or fees related to your order are the total responsibility of the buyer. We do not charge or pay, nor do we add or attempt to calculate any additional taxes or duty on overseas or outside the USA orders. Because we ship to countries all over the world, it would be impossible to know what liability, if any, the buyer may or may not have related to his or her purchase. It is highly recommended that the buyer check with the rules and regulations of his or her country to know what taxes or duties to expect when receiving shipments. Other Shipping Information: In most instances, restock items have been ordered from our suppliers and it may just be a matter of a few days before receiving them and filling orders. We will do our best to fill each and every order as quickly as possible, subject to product availability. Your order may be shipped without an item or items in some instances, but as soon as they are back in stock, they will be shipped immediately at no additional charge to the customer. If it is a matter of color and we have the product, we will contact you regarding other color choices in stock. In all cases, you will receive a notification if any item you may have ordered will encounter a shipping delay. If you wish to insure your purchase the same procedure of contacting us prior to ordering will apply. We strive to make customer satisfaction and affordable products number one. Our products have a one-year warranty for defects in material and workmanship. This does not include additional manufacturers warranties that may be contained with some products. Why buy our conductive silicone products?? As you probably already know, you can purchase conductive material and tubing from many different vendors on the Internet. Most of the time, it will be less expensive than ours and we are aware of this. We firmly believe that as the old addage states, "you get what you pay for" is still true today and our goal is to provide the best possible product to our customers for their hard-earned money. What makes our conductive silicone stand out in quality above the rest? Ours has been specially formulated to withstand the natural body oils and acids that are in a person’s skin as it exists in nature. We also sell our conductive silicone material to variety of small and large companies who use it for special applications and purposes. These companies are involved in the research and development fields, as well as the medical and computer industry. A few years ago, we sent a sample of our silicone tubing to a large company who who requested it. They had several other samples obtained from our competitors as well. We were not aware that they had extensive labs and testing equipment and were, in fact, testing every sample they received to find the best product for their needs. They subjected each sample to a rigorous test by submerging it in a strong jelly type solution and let it sit submerged for a day. 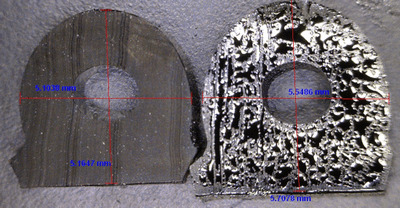 The technicians then took each sample out of the solution, washed it and cut a thin cross-section of each one and placed it under a microscope to see the results. To our surprise, we were sent a picture of a typical magnified section of our silicone tubing compared to almost all of the other samples they used for the test. Brand X showed that the jelly substance had begun to eat away at and deteriorate the outside and inside of the material. However, ours which was subjected to the exact test, showed almost no sign of any deterioration whatsoever. Of course, we were pleased that although our product was a little more expensive, they chose to place a large order for a couple of sizes of conductive tubing and continue to order and use it to this day. They just recently inquired about purchasing large quantities of conductive sheeting for other applications they are working on. A copy of the picture we were sent is shown below. Notice that the cross-section on the left (ours) still looks new compared to the one on the right that has started to rapidly deteriorate. So, you see what kind of quality you will be getting when purchasing any of our conductive silicone products. A TENS pin will fit snugly into our 4 mm x 2 mm conductive tubing or our 6 mm x 2 mm tubing without the need for any type of adaptor. Simply Plug & Play !!! A Standard Banana Pin will fit snugly into our 6 mm x 4 mm or 8 mm x 4 mm conductive tubing without the need for any other type of adaptor. Again, Plug & Play. Our 4mm solid cord or 4x2 mm tubing will fit snugly into 6 mm x 4 mm or 8 mm x 4 mm tubing. This allows you to connect two pieces of 6 mm or 8 mm tubing, in-line or in a circle. 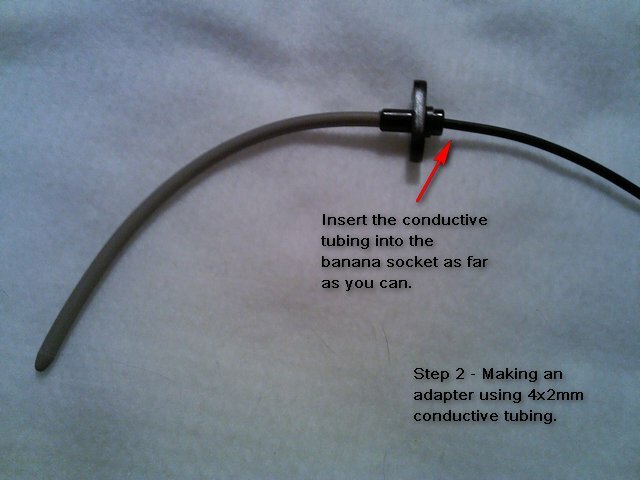 All sorts of connections are possible connecting our conductive tubing. If you a DIY person, be sure to visit our DIY section of our on-line store for a variety of adapters, fittings and connectors. The configuration possibilities are left only to your imagination. You can purchase any of the conductive rubber tubing products in our estore under the Conductive Rubber section. 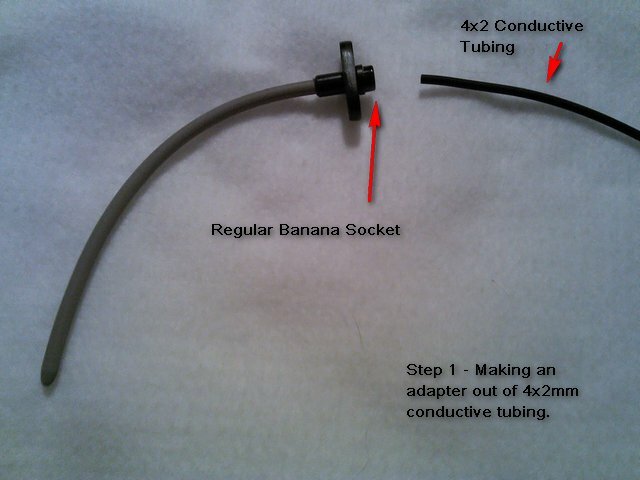 Once in awhile, you may purchase an electrode that has a banana socket for its connection and you were not aware of it at the time you purchased it. You wonder what you are going to do not since your TENS leads are too small to fit the sockets. 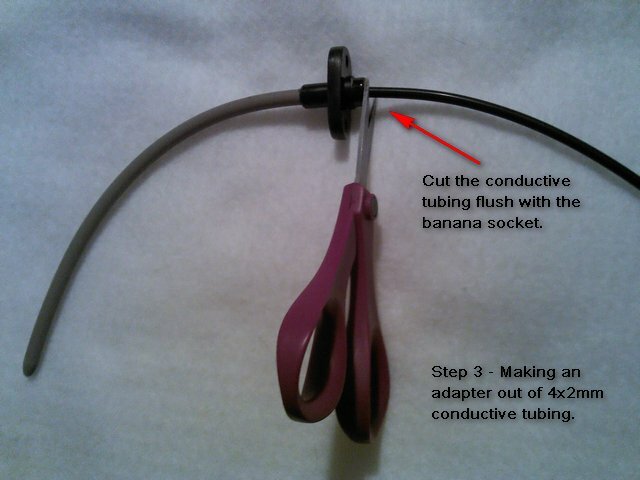 If you happen to have a small peice of our 4x2mm conductive silicone tubing, you can make a quick fix adapter that can be used permanently or until you buy a banana to TENS pin adapter. 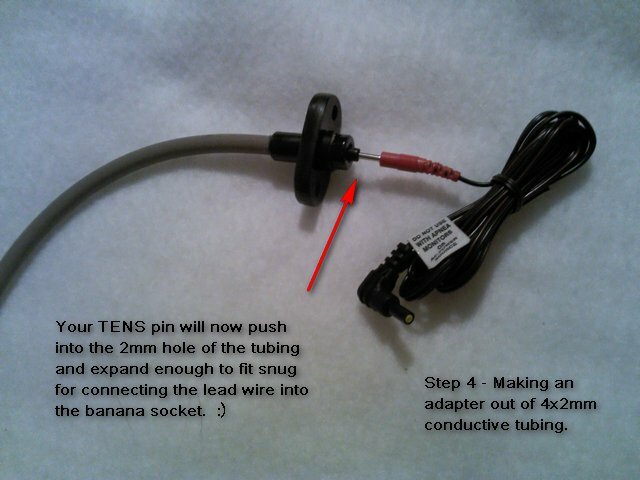 Here is a helpful illustration on how to convert a Banana Socketed electrode into a TENS pin connections. We hope that you find it useful. Conductive tubing is made by mixing an exact amount of carbon powder and silicone rubber together into a hot sticky mass and then extruding it into proper sizes and lengths. While this rubber is soft and stretchy, it does have its limits. After use, warm or hot soapy water is all that is necessary to clean it up. A good disinfectant soap and a good rinsing will do just fine. Water almost completely sheds off of our conductive rubber products and you only need to pat or lightly pull it through a dry cloth or towel to remove any water. Do not stretch the tubing as you pull it through to dry it. Over time, this will diminish the tubing properties, as it loosens and separates the carbon particles that were mixed into the silicone. It is not necessary to soak, boil or leave it sit in bleach water. Doing so will result in poor current resistance and again, breaks down the carbon particles that were mixed into the silicone to create its conductivity. If you find that any of the conductive rubber tends to stick to itself, simply apply a very light coating of any talcum powder or corn starch on it. This also adds life to the product. However, before use, you should rinse the power off ,as it may act as an insulator and cause less than desired current flow. The same care as described above should also be taken with any of our conductive rubber products, including urethral inserts, conductive sheeting and our flat 3/4" wide conductive rubber. Proper care will make your purchase last for years.